Ultra High Temperature Dairy Pasteurization - Hydro-Thermal Corp.
An original equipment manufacturer (OEM) wanted to use a direct steam injection heater in a large milk and ice cream aseptic system for ultra high temperature (UHT) pasteurization in a midsized Northeast dairy. 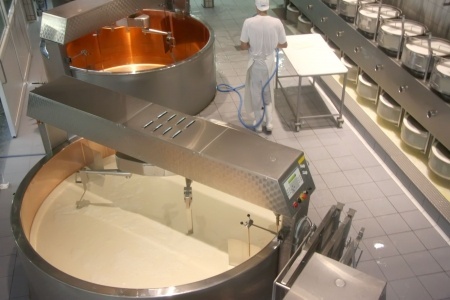 After reviewing the results of other Hydro-Thermal dairy installs, the company was eager to incorporate a Hydroheater. into this system. The pasteurization system that the OEM was working with was having difficulty holding precise temperature and was experiencing fouling problems resulting in several daily cleanings. They purchased an A210 Sanitary Hydroheater because it is 3A certified and is able to process food with low acidity. The OEM successfully incorporated the A210 Hydroheater into the larger aseptic system. They are happy with the Hydroheater’s use of sonic velocity resulting in a complete homogeneous blend of condensate with the product that reaches precise temperature in milliseconds. The hold tube is cleaner and easier to maintain compared to other direct steam injection heaters. In fact, the elimination of fouling resulted is lower maintenance costs. Finally, the flavor of the milk and ice cream mix has improved which the OEM has not experienced with any other steam injector or infuser.